Classic Italian tradition meets sophisticated Roman style at Giuseppe & Sons, an all-day ristorante by Schulson Collective. 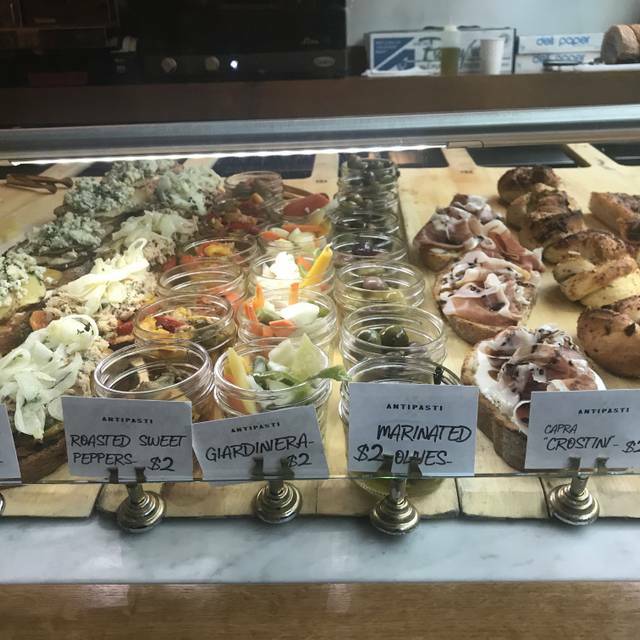 At Giuseppe and Sons, a new concept from Schulson Collective and Termini Brothers Bakery, you can expect Italian traditions paired with signature Schulson Collective hospitality and Home Studios design. Don’t bother. Lovely ambiance. Decent service. Mushy pasta. My expectations were high but food was average at best. I am originally from South Philly moved two years ago i been following you on instagram and couldnot wait to visit and have dinner. I met my sister for a birthday dinner and theater and our service was awesome our waiter was great with recommending we did the tasting. Everything was delicious and the manager made sure we enjoyed our meal and asked if we need anything. There is nothing like South Philly Italian cooking and our dessert a Cannoli was sooo good too. I already told a bunch my friends they must go and do the tasting. Best of luck with the restaurant. Great location in the heart of the city. Ambiance is gorgeous and cool. The food was good but nothing memorable. Recommend for a fun night out. It was good. They need a new management team quite honestly. The waitress was great. The drinks took forever. They forgot the app we ordered. My entree came out 20 minutes later than my dates. The manager was so aloof. Typically love this groups restaurants but his just was not good. The house salad was crisp and the dressing light. The octopus in the appetizer was tender. The pasta special with the peas and asparagus was delicious. 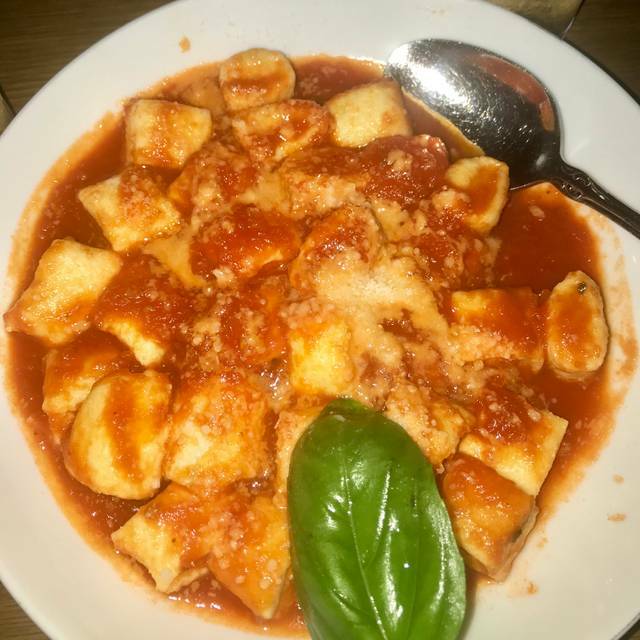 The gnocchi were like pillows. My friend ordered the swordfish and asked for the companata on the side. All requests were honored. The server was attentive. The bottles of wine were pricey. We would go back again, however. They are quickly becoming my favorite restaurant in Center City. Impeccable service, cuisine and cocktails. The environment is so pretty and Although you are in a very large room they have designed the environment to feel like small dining environments. Do go! Food was amazing! Such a cool atmosphere and the drinks were delicious! Would recommend for families or even a date night. Good food for the price. Wine list however was way overpriced. I will be a regular. 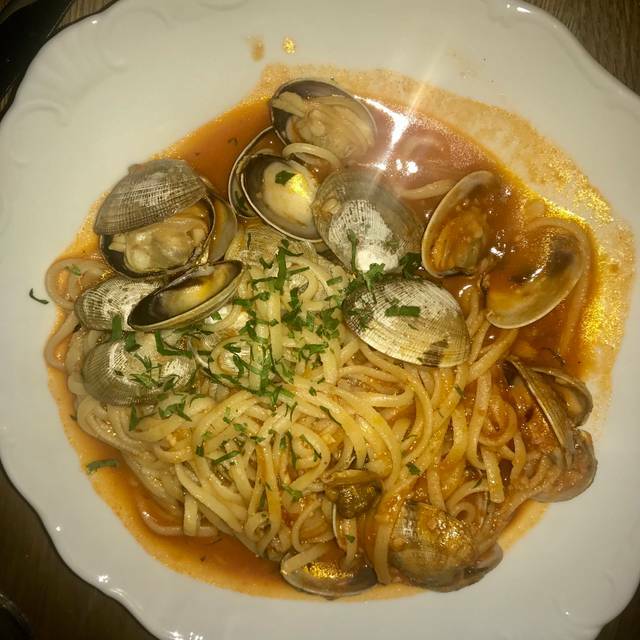 Our experience at Giuseppe & Sons was amazing. 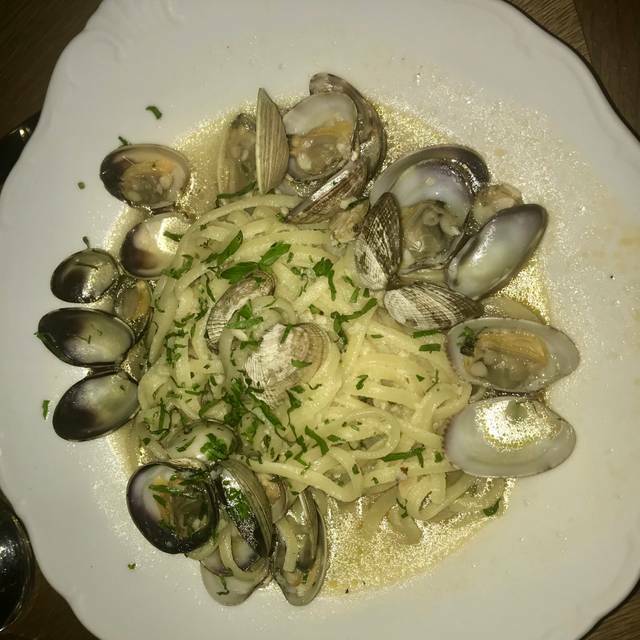 We have enjoyed other Michael Schulson restaurants and heard great things about Giuseppe & Sons. First, they were extremely accommodating to our party running late, which we truly appreciated. Like other Schulson Collective restaurants, dining here was an experience and cannot be rushed. Our server, Lisa, was the best!! She knew the menu inside and out and could speak to everything. Based on her recommendations, we decided to do the chef's tasting, which was a great deal for the price. 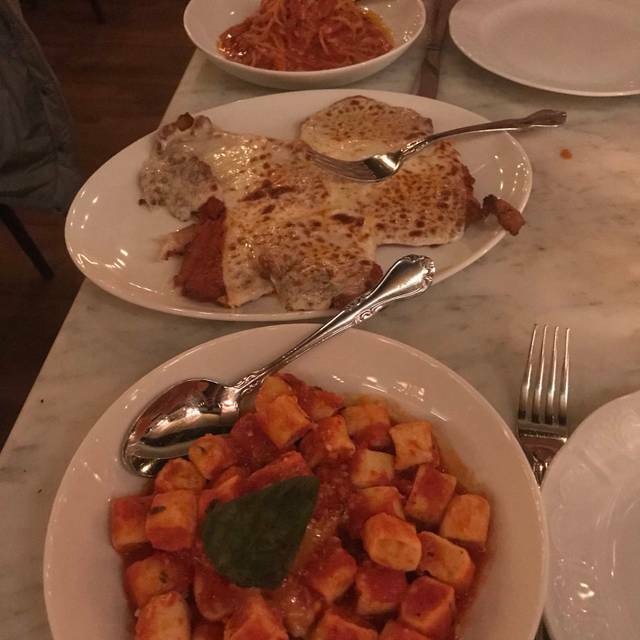 The food was impeccable - the cannoli at the end was the BEST part. We will definitely be back! Gorgeous atmosphere, informed, friendly and attentive service that was not overbearing. The food, drinks and service were outstanding. Too Much... too much salt in the food, overexuberant waiter, too dark in the dining room to the point that at many times people were looking at the menu with the light from their cell phones. Also, the room was too large and looked like dining room of a cruise ship. Honestly, the food was just fair. Many other places in Philadelphia with much better food and better value. So delicious, we ordered shrimp scampi, wild boar pasta, veal parm and chicken picata. Everything was great. Will definitely be back again. Also, big portions. Not sure about the tasting menu portions. Absolutely fantastic! Such a cool setting and it felt very private but not claustrophobic. The food, service, and ambiance were all outstanding! Loved it! Great atmosphere and everything we got was delicious! Very good across the board. The wait staff are very particular with your order method, i.e., you can not order appetizers until you've decided on entrees, but they are very professional and attentive. The food is a welcome different take on Italian cuisine, and the desserts were luscious. 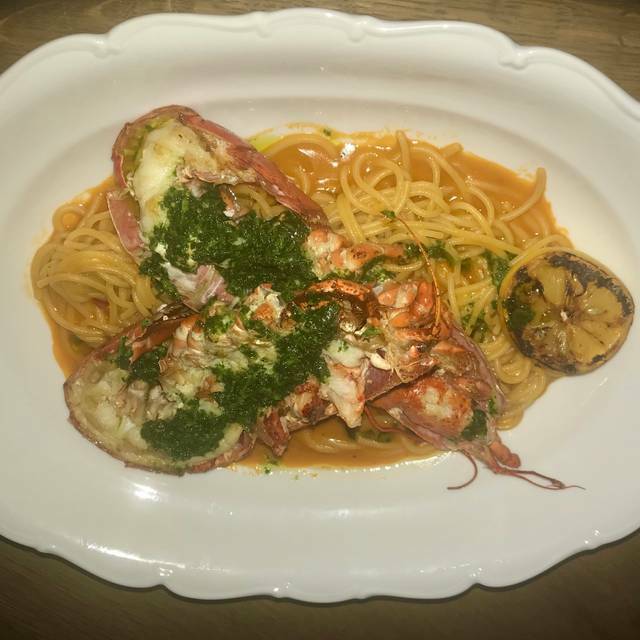 We thought everything about Giuseppe & Sons was outstanding. The food was fresh and wonderful, the service was great and I can't wait to go again soon! They are very busy arrive on time for reservation or you will wait! Amazing food and great service! And won’t break the bank! Cannot wait to go back! My husband and I dined here last week with another couple. It was our first time at the restaurant, and we were excited to try this very popular place. The restaurant has high energy and is very noisy. The food was fabulous but unfortunately the service was poor. Perhaps we had a new waiter. While he was very nice, he messed up throughout the entire evening-forgot to order an entree, brought us glasses of wine when we had ordered a bottle?,messed up our original drink order, forgot to bring bread after he told us three times he was getting it.... Anyway, I don’t like to criticize waitstaff, but we spent over 400.00 on dinner and it should have been perfect. Our server, Corinne (sp.?) was lovely and most hospitable. My only problem was that the timing of the tasting menu was rather poor. We had a small table for 2, and had virtually no time to luxuriate in the wonderful repast before another course came flying out at us. I understand the concept, but if it contraindicates the pleasure of leisurely dining wherein one might savor your delectable food, the pace becomes a frustrating annoyance. This style of dining needs to be more sensitively orchestrated. Excellent in every way possible! Loved it! Maybe if I had to say, a little more light at the table to read the menu. 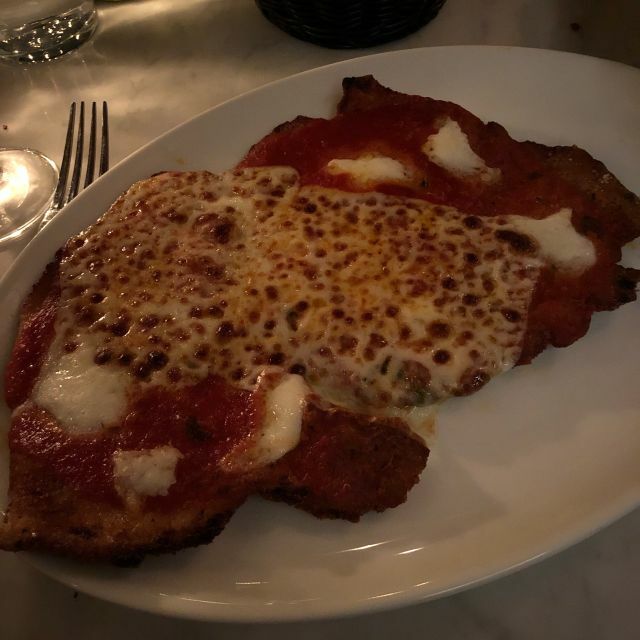 Giuseppe's was an interesting experience. Going to a cavernous lower level was initially disconcerting but once there we understood why. The space was large and tables were spread apart so it was a pleasant experience. Excellent job with controlling the noise factor and it was wonderful to be able to have a normal conversation with my partner. We did the tasting menu which was an extraordinary amount of food for two people. We really enjoyed virtually every course. The mozzarella and shrimp scampi appetizers were to die for. The house salad was wonderful. The Orichette pasta was good - very similar to one of my favorite cook at home pastas. Swordfish was great. Loved the caponetta. Chicken with the lemon/caper sauce was excellent, melt in your mouth delicious. Asparagus was ok. Canollis were good. Major complaint was service. The two appetizers and salad were all brought at once, too fast and too much. Then we had a pleasant long break, but again the pasta was too quickly followed by the entrees and the side. Needs to be a more relaxing pace. The room is designed to handle large tables so good for small groups. The best of traditional Italian with a nice contemporary touch. Loved the asparagus side, and everything else. The room is a treat in itself. Portions were very small especially for the price. The menu was designed for family sharing. It was barely enough for one person! The pastor and Sunday gravy was nothing outstanding. I personally prefer my own over what was served in there. Shrimp scampi best in l The menu was designed for family sharing. It was barely enough for one person! The pastor and Sunday gravy was nothing outstanding. I personally prefer my own over what was served in there. Shrimp scampi was amazing! Desserts were outstanding. But meal...ehhh! I want this place to be my favorite place. Caesar salad was bright and had great flavor. Saltimbocca not what I expected (tasted like short rib) but still wonderful. The two cocktails I had (10th and Tasker and a dessert cocktail that was lemon) were nothing short of AMAZING. Like, both were perfectly constituted and balanced and delicious. 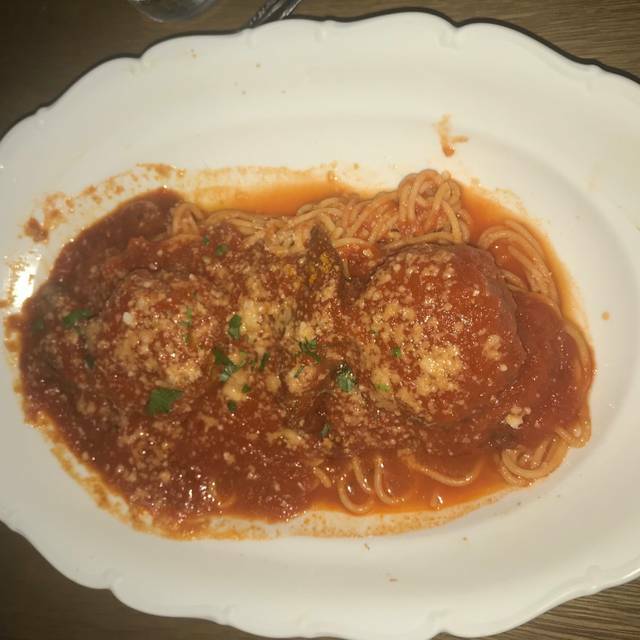 The chicken parm, looked so pretty, but was a little tough and flat tasting. Gnocchi was perfect as was the sauce for it. Cannoli perfect, better somehow than what I get when I go to Termini market. And last, the alla amatriciana - pasta great al dente, and again a little too quiet on overall flavor. Pretty good food. We ordered way too much for two people. The servings are plentiful. Hands down our favorites were the chicken Milanese and the house salad. The place was loud, though, even tucked in our back corner it was hard to hear each other. Best dinner I've had in all of Philadelphia. Food, ambiance and service was outstanding. Will definitely be going back there again. The chefs tasting menu for $45 is an absolute bargain for how much food you actually get. It's all delicious by the way. In my opinion 5 star restaurant. Had a stellar meal at Giuseppe & Sons. 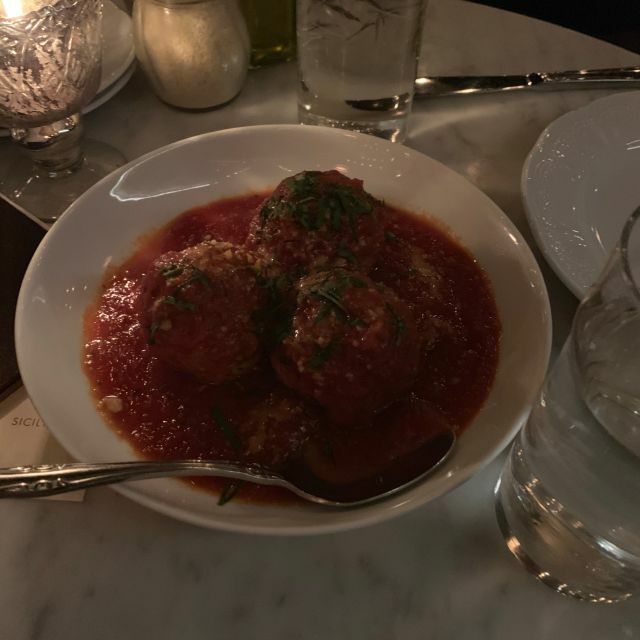 For our party of 5, we ordered the meatballs, clams (white), and arrancini for appetizer, and then the house salad and side of white beans & escarole to go with our main dishes of gnocchi, oricchiette, and chicken picatta. For dessert we had a cannoli, chocolate cake, and tiramisu, as well as coffee and cocktails all around. I would recommend ordering a-la-cart rather than the tasting menu for a party of this size, as with all of the above we spent less than what we would have had we elected the tasting menu. For a larger group, the tasting menu may be better as they bring enough of each dish to fit the number in the party. My only complaint was that we waited a while to get a second serving of bread to sop up our leftover sauces on our plates, and had to remind staff to bring us bread and not take our plates. Overall a fantastic meal, we will be back! It was absolutely wonderful and we’re looking forward to having dinner there again on May 18th.